Lots of people find ways to recycle their old Christmas cards, this design starts at the beginning by encouraging the reuse of materials in its construction and has the added advantage in that it combines the functions of card and gift. 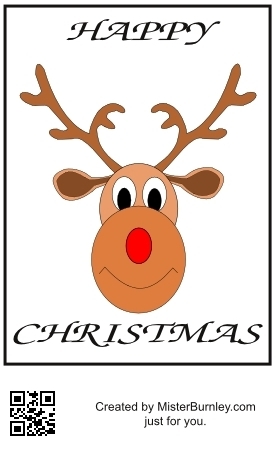 The card uses the character, Rudolph the red nose reindeer, as it’s main image combined with the use of a 3v lithium battery and a red, light emitting diode to provide the glowing red nose. The LED is connected to the battery without a switch so it will glow until the battery is exhausted. This provides the opportunity for some practical science and further involvement of the recipient in predicting how long the LED will continue to glow and in recording how long the LED remains glowing so gaining a practical feel for the amount of energy contained in one of these batteries. The graphics and instructions are offered to you by MisterBurnley.com as a celebratory card for Christmas and can be downloaded by clicking on the PDF files. There are Two pages, one with the instructions and one with the card.